Swan Heart Chocolate Mold. Approximate Size: 4 x 4 inches. Heart with Dove Chocolate Mold. Approximate Size: 3 x 2.25 inches. Also Available In Hard Candy Molds. Heart with Doves Chocolate Mold. Approximate Size: 1.5 x 1.5 inches. 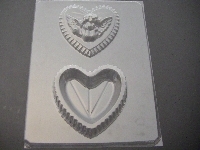 Heart Pour Boxes Cherub Lid Chocolate Mold. Approximate Size: 2.25 x 2.5 inches. Couple on Heart Chocolate Mold. Approximate Size: 2.5 x 2.75 inches. Also Available In Hard Candy Molds. Heart Pour Box Cherub Lid Chocolate Mold. Approximate Size: 4 x 3.75 inches. Heart with Swan Chocolate Mold. Approximate Size: 2 x 2.5 inches. Also Available In Hard Candy Molds. Standing Cherub Chocolate Mold. Approximate Size: 3.75 x 2.25 inches. Also Available in Hard Candy Molds. Cherub Chocolate Mold. Approximate Size: 1.5 x 2 inches. Large Heart Chocolate Mold. Approximate Size: 3.5 x 3.25 inches. Heart Pour Box Chocolate Mold. Approximate Size: 3.5 x 3.5 inches. Heart with Flowers Chocolate Mold. Approximate Size: 2 x 2.5 inches. Also Available In Hard Candy Molds. Sign Language I Love You Chocolate Mold. Approximate Size: 2.25 x 1.75 inches. Also Available In Hard Candy Molds. LOVE Heart Chocolate Mold. Approximate Size: 2.5 x 2.5 inches. Also Available In Hard Candy Molds. Lips Chocolate Mold. Approximate Size: 1.5 x 2 inches. Triple Heart Chocolate Mold. Approximate Size: 2.5 x 2.25 inches. Also Available In Hard Candy Molds. Plump Hearts Chocolate Mold. Approximate Size: 1.25 x 1.25 inches. Also available in hard candy. Conversation Hearts Chocolate Mold. Approximate Size: 1.5 x 1.5 inches. Heart with Rose Chocolate Mold. Approximate Size: 3.5 x 3.5 inches. Also Available In Hard Candy Molds. Heart with Cherub Chocolate Mold. Approximate Size: 2.5 x 2.5 inches. Also Available In Hard Candy Molds. Quilted Hearts Chocolate Mold. Approximate Size: 2.25 x 3 inches. Also Available In Hard Candy Molds.